In 2008, after five straight years without a single official remix project, EPE finally announced a new remix from a well-known Italian DJ who goes by the name of Spankox. Speculation in Elvis world wondered if they would have authorized another obscure song in the manner of “A Little Less Conversation” and “Rubberneckin’,” perhaps the long-time fan requested remix of “Let Yourself Go” or another similar late 60’s movie song. Instead, it was Baby Let’s Play House, Elvis’ fourth original single at SUN Records. Fans were utterly speechless. “How could they let this so-called DJ ruin a SUN masterpiece?” They asked. And then, it was released – with an official video clip. Spankox had taken the same route that JXL had taken – he had left the integrity of the original song intact while adding modern dance club beats and effects. In fact, the Scotty Moore guitar riff plays a more prominent role in this version than in the original master recording. The song was an instant international smash hit. In Spankox’s native country, the song was a number one hit for five consecutive weeks before being overtaken by Timbaland and OneRepublic’s “Apologize,” but then took the throne again the following week. In some other European countries, it made the top 10 – a true testament to Elvis’ staying power in the world, considering he’d had been dead for 31 years and the original recording itself was 53 years old. Spankox was mostly praised in the Elvis community for the remix, as it was far more difficult to remix a 50+ year old mono track than a more modern multitrack song. However, Spankox and EPE released a statement that in Europe, they would be releasing Elvis’ first full remix album, to be entitled “Elvis Re:Versions.” However, the album would not be released in the US. The reason? The entire tracklist was made up of songs originally released prior to 1957, meaning that the copyright on them had expired in the European Union, but not in the United States. And the songs on the tracklist split the gap between remix lovers and traditionalist Elvis fans even further. Older Elvis fans were in shock. Half the album was made up of “sacred” SUN tracks. That’s All Right, Blue Moon of Kentucky, Just Because, You’re A Heartbreaker, and of course the lead single Baby Let’s Play House. Once was a gimmick, twice was too far. Elvis fans took to the messageboards and comment sections of the articles regarding the release of the album and began filling them with hate messages before having even heard the album. Hey everyone, after a 3 year delay, The Remix Master Returns! I will be updating this site with more Elvis photos, updating the master remix list with tons of new ones that have come out since the release of Viva Elvis! Here’s one of my favorites, from the Elvis: Bossa Nova Baby album that came out this year. Over the past ten years that Elvis remixes have been in existence online, I have watched as technology has evolved to allow amateur and professional DJs alike create their own twists on the music of a man who changed all of our lives. In coming up with my collection that I have, I have searched long and hard to find and document what I consider to be “true” remixes. The definition of a remix, as far as this website is concerned, is a track that changes or adds elements not originally in the original master track, or dynamically changes the arrangement of a song. These so-called “remix albums” online are merely re-edited masters. Whatever overdubs they might have are minimal at best, and I have read of some remixes on these compilation albums being miscredited (whether intentional or not) to someone who did not create them. This is completely and utterly unacceptable and there is too much risk with amateur audio editors who create HUNDREDS of “remixes” to count them on this website’s list. Also not included, by the way, are bootleg albums which compile remixes found elsewhere (not created specifically FOR that CD.) It’s easy to find mp3s online, and burn a hundred CD-R’s with Lightscribed or printed labels and mocked-up album covers. I could do that with this very website, but I do not. I find it reprehensible and a mockery of the art of remixing. But if you find anything, certainly send it my way and I’ll see about adding it to the list. When the “A Little Less Conversation” and “Rubberneckin'” remixes were released in 2002 and 2003, respectively, the underground mix scene quickly picked up on the scene and several remixes were released without the authorization of Sony/BMG or Elvis’s estate. Underground remixes began where most people would think they would: in clubs. DJ’s mixed and “mashed” songs together or added their own sound effects or loops to an already existing master they had in their possession and would create their own customized version of the song. With the rise of the internet, bootleg remixes, not just of Elvis, but of any artist in general, rose quickly into popularity, especially with easily obtainable and easy-access audio editing programs, and quick means of release, like video sites like YouTube. The earliest of some of these “boot” remixes were alternate mixes of the already-released tracks “Little Less Conversation” and “Rubberneckin’.” Skeewiff, a duo of DJs, were the first to make an unofficial remix of “ALLC,” and instead of following JXL’s lead and using the Comeback Special rerecording, they used the original master take from “Live a Little, Love a Little.” The different in tone is astounding. Where JXL’s mix has serious bite and begs to be danced to, Skeewiff’s is far more laid back. A “mash-up” is when you take one song’s vocal track and lay it over a different song’s background track, or vice-versa. Some results are disastrous, where others are surprisingly similar and work very well together, usually due to similarities in key changes. Simple audio editing can be used to match tempo together. An early bootleg Elvis mix mashed up the “Little Less Conversation” film master (I guess the remixers didn’t realize that JXL used a different master) and combines it with the dance hit “Pump Up the Volume” by M/A/R/R/S. A second underground mash-up, done around the same as the offical Rubberneckin’ remixes, mashed up said track with Pink’s “Feel Good Time” from the soundtrack to the film Charlie’s Angels: Full Throttle. Arguably the most “danceable” of all the tracks, it’s a good combination of two very different songs. This remix of Rubberneckin’, interestingly enough, was created just PRIOR to release of the official remix by Paul Oakenfold and actually did chart in the UK, which is especially surprising, considering it wasn’t offically endorsed by EPE or Sony. This remix is perhaps the most intriguing of all though, not just for that reason. The mix was created completely from elements within the multi-track tapes of the master recording. Nothing was added, everything simply rearranged. The other remixes here were likely done using an mp3 of a master track and editing that. However, this mix was created by Joseph Pirzada, who later became famous in the Elvis world for his UK-exclusive releases under the “Memphis Recording Studios” label that was basically an independent answer to Sony’s Elvis-exclusive Follow That Dream label, which is headed by longtime Elvis recording “master,” Ernst Jorgensen. And a year later, when Elvis remix fans were begging for a new remix, when Sony/BMG didn’t deliver, Joseph Pirzada did. In 1968, a young and aspiring singer-songwriter was just beginning his career. Another, more veteran performer was beginning to pull his from the depths of a decade-long slump. The singer-songwriter was Mac Davis, who hailed from Lubbock, Texas, and had yet to cut a full-fledged record yet. He would later put out several hit albums as a country-pop crossover act in the seventies and eighties. But 1968 was a turning point for both men. Earlier that year, Elvis starred in “Live A Little, Love A Little,” a trippy film based on the novel “Kiss My Firm But Pliant Lips.” The sole single release from the film was the bland ballad “Almost in Love,” sided with a song Mac Davis had co-written with Billy Strange, titled “A Little Less Conversation.” Davis had originally written the song with Aretha Franklin in mind, as a bluesier pace than Elvis later recorded it. Later that year, Elvis starred in his now-classic “Comeback” NBC television special. Though Col. Parker wanted a Christmas-themed show exclusively, director Steve Binder had different ideas for Elvis, and, hiring Billy Strange as musical arranger for the special, set out to help the King reclaim his career. 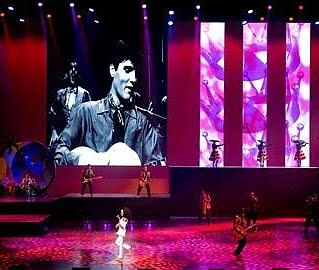 The last section of the show was a mini-movie featuring a medley of some of Elvis’ previous songs in a semi-autobiographical order. The original concept of the special was to intersperse this content with live concert footage, linking it all together with a re-recording of “A Little Less Conversation.” In the end, the idea was dropped and the recording remained unreleased until 1998’s “Memories: The Comeback Special” CD. In 2002, preparing for the Nike Football (Soccer in the United States) World Tournament, Nike funded a massive international marketing campaign featuring the world’s best football players going head to head in caged matches. For the background track, they hired Dutch DJ Junkie XL (Real Name Tom Holkenberg) to create a hip dance track that would be open and accessible to fans of football around the world. He had heard the master track of “A Little Less Conversation” a year earlier when it had been used in the soundtrack of the remake of “Ocean’s Eleven,” and, with Elvis’s estate’s approval, used the ’68 Comeback Re-recording to create the track that changed the entire public’s perception of Elvis in the 21st century. Since its release, it has been featured in at least ten feature films and several television programs, most notably the show “Las Vegas,” in which the remix serves as the show’s theme song and the popularized song, which had only reached #69 on the charts when first released on 1968, became the song practically synonymous with Elvis Presley and the public image of Elvis, a fat singer in a jumpsuit, changed practically overnight again to a young, hip, talented artist that left the world a great cultural legacy.